One of the most basic human rights is to have somewhere safe and stable to live, yet homelessness continues to be one of the worst social problems in Britain today. On a personal level, I’ve only had to sleep rough (not by choice) on one occasion. Back in 2002, I was working at a summer camp in New York State. During a night out in Lake George, and on impulse, myself and two colleagues decided to skip our curfew and stay out and party. We assumed we would be able to rent a motel room for the night, but unfortunately we were mistaken. We walked to every hotel and motel we were aware of in the whole town, but nowhere could we find a bed for the night. We got so desperate that, in tears, I begged one hotel manager to let us pay him to sleep on his office floor. I think he almost gave in, but unfortunately said he couldn’t let us stay at his establishment. With no other choice, we slept on the side of the road. Unfortunately, we made a rookie mistake. We chose to wait out the night on a road running alongside a park. It was only when the sun came up the next morning that we realised the whole area was covered in dew and we were soaked. I was lucky, though. I had enough money in my pocket to go and buy some breakfast whilst we waited for our bus, and once we returned to camp I was able to have a hot shower and sleep in a warm bed. My experience in America is what inspired me to take part in the Cardiff YMCA Sleep Easy Challenge 2013 on Friday night. 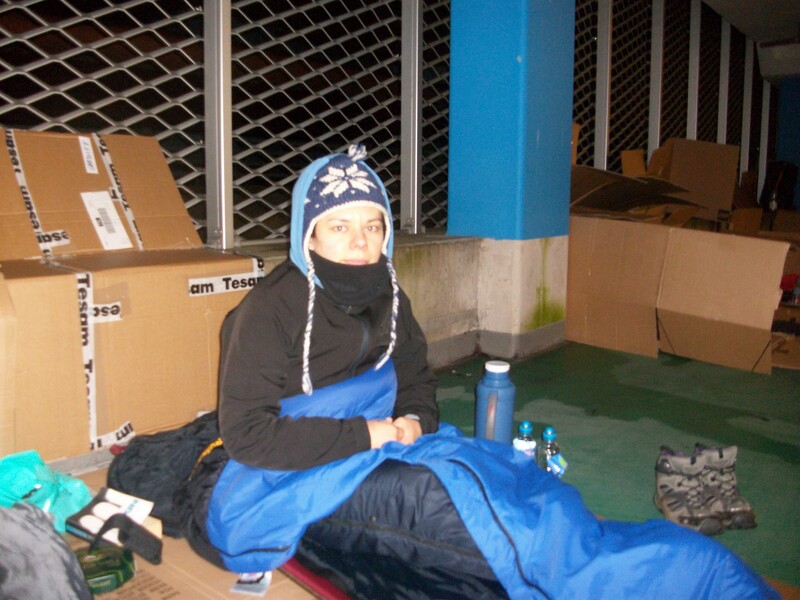 Over 100 of us slept rough in a city centre car park to raise awareness of homelessness in Wales and to raise much needed money to fund an emergency room at the YMCA hostel. I was so determined to take part in the Sleep Easy Challenge this year that I would have gone along on my own, but I’m very pleased to say that my good friend Geri volunteered to come with me. We arrived just after 8pm, and joined in the scramble for cardboard to make our beds. This is only the second year that the event has taken place in Cardiff, and the organisers weren’t expecting so many people to turn up. Two of the car park staff were up and down in the lift for over an hour, trying to bring up as much cardboard as possible with one bin between them. There was a really great atmosphere in the car park, a sense of community as everyone came together to support each other through the night. At around 10pm, the good old Welsh weather demonstrated what it is known for as the wind started to pick up and howled through the car park. Geri and I tried to make our area as comfortable as we could. I’m proud to say that I raised £145 for YMCA. I also had the added bonus of sharing a great experience with a bunch of fantastic people. The hope is that the Sleep Easy Challenge will get bigger and bigger every year. How great would it be if they could one day fill the whole car park with fundraisers?